I submitted the following note to Glenn Beck through his website’s Contact page. Help me let all these folks with a national voice know about space based solar power and ask them for their help in getting the technology and its potential in front of the American people. Space-based solar power could very well be the moonshot you mentioned tonight. We have the technology to collect solar energy with solar power satellites, beam it to rectifying antennas (rectennas) on earth in the form of low power microwaves and connect it directly to the existing electric power grid for distribution. It is a complex and expensive engineering project but it would provide unlimited, clean energy. It could eventually be scaled up to provide a major portion of the world’s energy needs. But we need to get started and you can help get the word out to the politicians and the public. 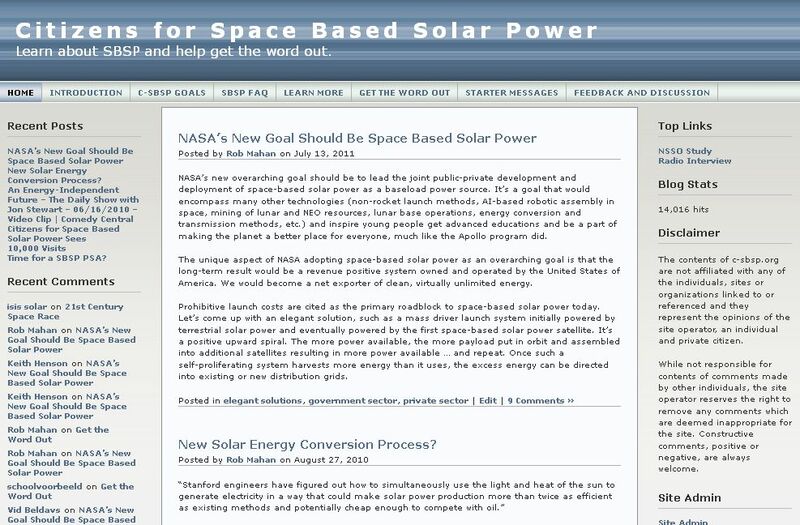 There is a lot more information and links to resources on Citizens for Space Based Solar Power (http://c-sbsp.org). Please help get the word out about this potentially game-changing technology. To borrow a phrase from Newt Gingrich, space-based solar power must become part of the “national conversation”. None of the presidential candidates mention space-based solar in their ideas for our energy future. Even Bill Richardson, former Secretary of Energy who published his views on our energy future in “Leading by Example”, does not even mention the concept of space-based solar power. Do we need a nationally recognized spokesman (Neil Armstrong, Buzz Aldrin, John Glenn, John Young, Charles Simonyi, Tom Hanks, Mark Harmon, George H. W. Bush, Colin Powell, Norman Schwarzkopf, Al Gore, Burt Rutan, Bill Gates, Richard Branson, Francis Everitt, Stephen Hawking, … ) to become the public “face” of space-based solar power? Do we need to hire a marketing or advertising firm to help get the word out on a national level? Do we need to hire a political consulting firm or a defense contractor consulting firm to help navigate the case for space-based solar power inside the beltway? I learned that for every complex problem, there is a technical solution, a financial solution and a political solution. If you don’t answer all three, you don’t have a complete solution. There appears to be a lot of focus on the technical solution for space-based solar power (which of the three, I often think is the easiest to solve), but I’m not hearing or finding a lot on the financial or political solutions. Help me help figure out “What comes next?” so we can get started on a complete solution for space-based solar power that will lead America to energy and fossil fuel independence and enhanced national security. Image: Solar Power Satellite Concept ©Mafic Studios, Inc.